View More In Flagpole Hardware. 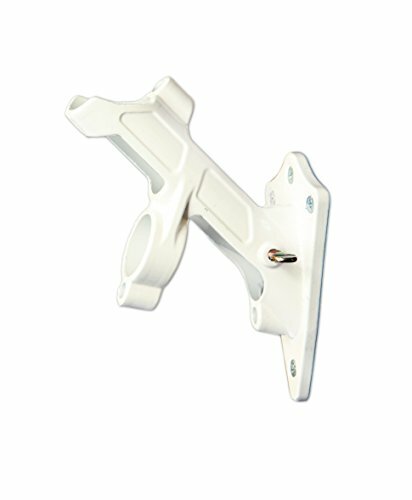 This White 2-Position Metal Flag Pole Bracket is the best way to mount your Toland Home Garden House Poles to your home. The sturdy metal bracket has two positions; 45-degree and 90-degree angles. Bracket easily mounts to your home with the included mounting screws and the thumbscrew easily tightens to secure any Toland Flag Pole into the bracket. Flags and Flag Poles sold seperately. EASY TO USE: Easy to mount the bracket to the side of your home using the included mounting hardware; to secure any 1" diameter flag poles into the bracket just tighten the bracket's thumbscrew and you're done! If you have any questions about this product by Toland Home Garden, contact us by completing and submitting the form below. If you are looking for a specif part number, please include it with your message.